Anyway, dicks in sitcoms. Wave of the future! The Great Louis CK's much-anticipated new HBO sitcom, Lucky Louie, premieres Sunday night at 10:30. I linked to this article in the Boston Globe about Louis and the show a long time ago, but it's still good. 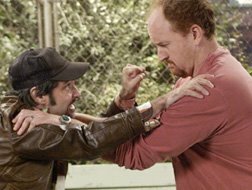 I'm a huge Louis CK fan and I'm crossing my fingers that the planets will align in favor of smart comedy and the show will be a hit. Everyone, watch it! * Excellent Boston Globe article about the excellent Louis C.K. and his upcoming show, Lucky Louie, on HBO, which is being proclaimed no less than the savior of the sitcom. If you haven't already, check out his special on HBO On Demand. Every single second is pure comic genius. Lots of clips and stuff here. "I. Hate. Needy. Comedy. Ninety percent of comedy films, ninety percent of sitcoms, are the neediest, most desperate, please God, what can we do to make you laugh? Please, anything, what do you want?" Patton also has a write-up of the second episode of Comedians of Comedy (including outtake clips) on his blog. * I got the link to the Louis C.K. Boston Globe article from the great new-ish comedy site, Laugh Machine, which is now a daily read. * Once again, I'm headed out to L.A. this weekend for Comedy Central's Last Laugh '05 event. The talent lineup hasn't been officially announced yet, but I'm really excited about it this year and I think many readers of this site will be too. If anyone knows of anything fun going on this Saturday night in LA (particularly if it's comedy-related), email me!